Welcome to Unicon Grand - apartment of style and sophistication, nestled in the heart of the Gulbarga at Venkatesh nagar.It is within convenient distance from Railway station and Bus stand.The apartments are enclosed in quiet environs with a subtle ambience and an air of comfort and convenience. It's a perfect place to relax - a home away from home! 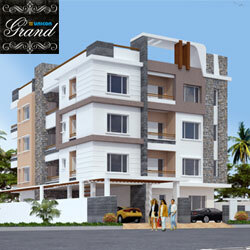 Unicon Grand apartment has 2 and 3 BHK Flats spread over four floors. It offers the best and latest accommodation amenities under one roof. In addition. Unicon Grand is the perfect choice for people who believe in Healthy and Happy Living. It is designed keeping in mind your desire of a dream home,its an unique opportunity to shape your living space according to your tastes and values. It provides you with a living experience that is distinct and exclusive. The Planned development in surrounding areas with Upcoming malls,Super markets and Roads the region will be catalyst for the emergence of new hub of modern living. Venkatesh nagar has emerged as new destination of Rich & Famous,because today you are known by the address you are staying & what better than Venkatesh nagar in prime heart of City. Design of the flats following the Vaastu principles for general well being , good health & prosperity of the owners. RCC Framed Structure – Designed for earthquake moments, confirming to BIS norms, using design concrete mix- all materials confirming to BIS standards. Steel of ISI make & 43 grade ACC cement,In Superstructure All external walls & internal walls with mud bricks of Good quality. All internal walls with Lime Plaster base topped with 2 coat JK or Birla putty and External Walls with double coat, cement mortar Sponge Plaster finish. Drawing/Kitchen/Bedrooms & Hall in Vitrified Tiles of Kajaria/Somany make or similar, with matchin 4”skirting and Wooden flooring for Master Bedroom with matching 4” skirting. All corridors in attractive flooring. Parking areas in cement concrete floors. Main Door in Teakwood frame & shutters,All internal doors with Salwood frame and moulded flush doors of Good Quality,with all hardware in brass fittings fitted with cylindrical lockable handles. UPVC sliding windows with MS safety grills. Polished 12mm thick granite platform with SS sink of Nirali make or similar, Ceramic tile dado of 3’ above the granite counter & provision of water purifier & cooking range electrical points. Supply drinking & non drinking water- internal & external lines through CPVC pipes, Hot & Cold wall mixers in all toilets. All Sanitary Pipes & fittings of ISI make , with all sanitary wares of CERA make,Cascade EWC for master toilet. Internal Painting in acrylic Plastic emulsion double coat , External Painting of APEX paint over a coat of cement primer, Polishing to the main doors. All electrical wiring of RR Cable or similar, with all circuits\ controlled by MCB, in double door DB of MDB make. All electrical points controlled by Anchor make modular switches. A/c points in all Bedrooms and Hall, 15amp. power points in toilets & kitchen. Power plugs for Fridge, Mixer, computer, music system and TV & provision for Invertors. Attractive corridors with false ceiling & lighting on each floor. Registration, Service Tax & VAT are charged extra. All materials specified are subject to change under non availability of material, and equivalent material will be used under such conditions. Copyright © 2011 MALU PIPES. All rights reserved.